Triplanetary by E.E. “Doc” Smith is the first book in the Lensman series, first published January 1934 in Amazing Stories. 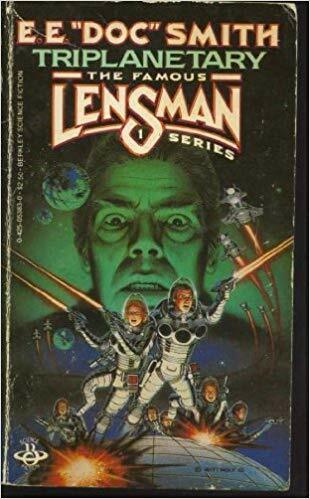 There are six total books in the Lensman series. I chose to read Triplanetary because I am expanding my knowledge in Science Fiction. I don’t want to study Science Fiction per se; I want to experience authors referred to as “greats.” So far I have read Author C. Clarks Rama series, C.S. Lewis Out of the Silent Planet, and more recently Larry Niven Ringworld. What makes Triplanetary fun is not just the story. While you are reading a Science Fiction book from the 30’s you are transported back in time to speculate about the future. You go back to 1934 and ask, “What does the future look like?”. The future is full of switches and dials, Men looking through lookout plates, and ultra-wave communications. Throughout the book, there are constant reminders of the culture at the time this book was written. Most notably, the love story between Conway Costigan and Clio Marsden. In the book, Clio is a 19-year-old daughter of a wealthy businessman and Conway is the first officer of a Triplanetary spaceship. I don’t believe Conway’s age was ever said but I would guess him to be close to 10 years her senior. Like all books of this era, Triplanetary is challenging to read. Not only is the grammar different — written in such a way — the vocabulary is much more diverse. Even still, Smith uses conversational slang such as calling people “Scout” or referring to killing as being “rubbed out.” It’s not entirely distracting once you get a few chapters into the book. The book starts out explaining the two elder races. It was interesting but very boring. I had to re-read it several times to keep track of who the Arisians and Eddorians are and which one is good and bad. When the next chapter skipped to Atlantis and it was a strange version of modern day (the 1940’s) and future technology and intended to introduce the human genetic lines of the story and display the interference (or lack thereof) of the two master races. The next chapter is based in Rome I grew frustrated while reading this chapter and almost gave up on the book. At the time some of the details seemed like nonsense and completely irrelevant. Once you get through Atlantis and Rome you get to Book 2 and essentially get the exact same story albeit set in the World Wars. The Wikipedia entry for Triplanetary says Smith added the beginning chapters when he published the book in 1948. It makes sense because when I went back and read the chapters after I finished the book the details were very relevant. My opinion is you should skip these chapters when you read the book and experience it as it was originally published in Amazing Stories. Once you get past what is labeled books 1 and 2 and you finally get to book 3, Triplanetary. As this point I’ve lost hope in the book. Typically I can read a book this size in 2 or 3 days. I had been working on this book for WEEKS! Triplanetary is constantly quoted as a space opera classic and a must read. With this is mind I dove into book 3 (aka chapter 3). I’m glad I stuck with it. Triplanetary had finally become a real space opera book. Humans had recovered from war and formed the Triplanetary League. The story is a bit disjoined with two story arcs intersecting at roughly the midpoint of the book. The first fight is with pirates controlled by Grey Roger. During the fight with Grey Roger the Nevians make an appearance. The Nevians are an amphibious race in search of iron. Humanity must overcome the superior tech of both Grey Roger and Nevians. There are several characters which have featured heavily in the book. The primary story is centered around Conway Costigan. Throughout the arc, Conway is in the middle of fighting, is captured twice, escapes and somehow manages to fall in love with Clio Marsden. There are plenty of great space battles, technology inventions, and creative science. The Triplanetory story is good. The first 2 “books” within this book are terrible. In fact, I have to ignore them to award 3.5 stars. The only saving grace was they were fun to go back and read. The Nivian portion of the story arc is irrelevant. In my opinion, Smith should have stuck with Grey Roger interference or other Eddorian anchored stories. Conway Costigan and Clio Marsden are very well developed characters. I enjoyed their interactions and personalities. The first 2 “book” really hurt the pace of this book. Once you get through them and into book 3 the pace is excellent. It tough to judge originality of books this old. The invention of future technology from technology in the 30’s is apparent throughout this book. Even though the book was very original the technology was not fantastic. The concepts of screens (aka shields) were interesting but other areas such as having to aim ultrawave plates at earth for communication were mediocre. I don’t expect authors to invent the science for every technology in a book, but there should be a few grandiose improbable technological leaps in any good Science Fiction. I kept the rating at 4 stars based on the age of the book. Real world technology moves fast and damages the reliability of vintage Science Fiction. All in all the book was worth the read. I picked up the original 1934 issue of Amazing Stories so I can re-read Triplanetary and see how different it is. Look for that post in the near future. I also picked up the next book in the series, The First Lensman. Hopefully it’s and easier read.